Viewer ratings/popularity totally unrelated? 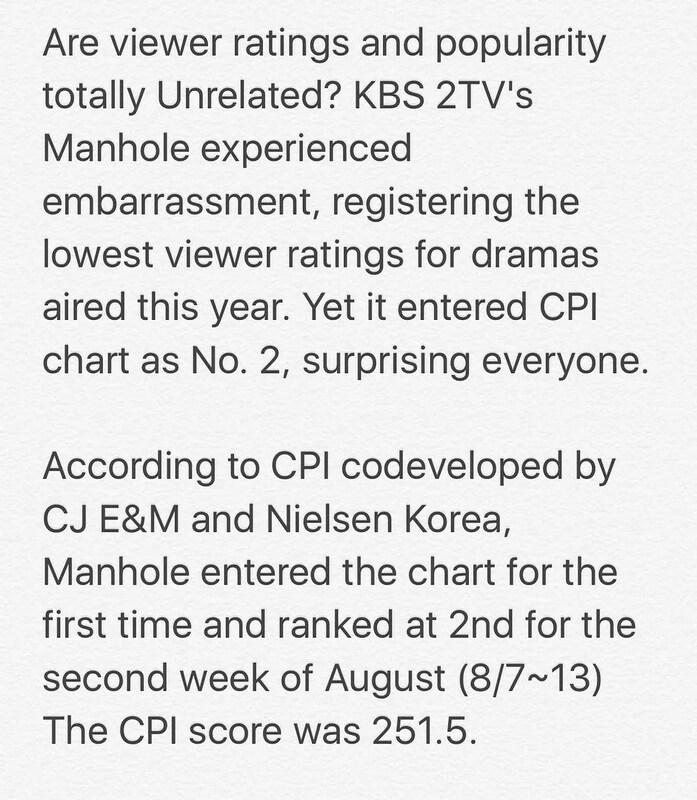 #Manhole enters CPI (Contents Power Index) Chart as Nº.2! Yeah, what can we do to help me.. Let us pray for the rating to grow up till last epsd.. I want to see the PPAP flashmob too.. Manhole fighting!!! It’s internet vs, traditional tv, and considering the sample size (only 2000) for entire SK, I don’t know how reflective tv rating is. I’m intrigue of the methodologies used in their research. Tell us why??? But im so glad that korean media esp. 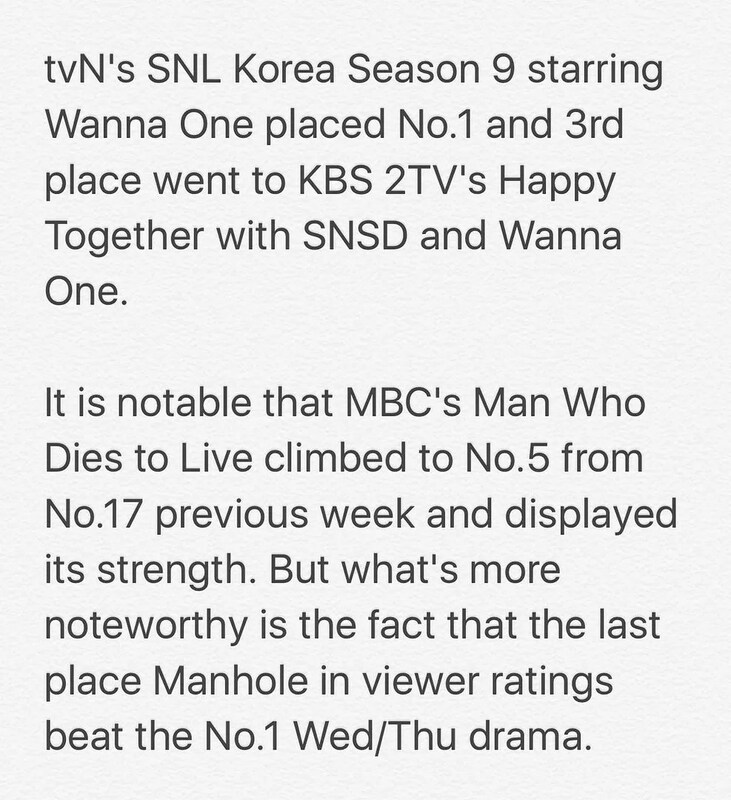 naver always show support towards manhole, there also think that manhole rating is so suspicious.. I can accept if the rating start with 5 above.. But 3/2 is too much… Manhole fighting!!!! I’m really curious how those 2000 people meters distributed throughout SK and if every episode they have new set of 2000 households..I’m watching Falsify kdrama, I don’t want to think Manhole is a victim of “falsify” where one phone call can change things to one’s favor ….it’s only a drama! So audience measures is broader in internet..than the traditional tv which is done in different areas, specifically place..but youth right now as a whole are watching less traditional tv…now which one is more the influencing factor when it comes to rating? yes, this is interesting since i’ve not seen a kdrama with a wider gap percentage in viewership rating and popularity ranking. Content Power Index (CPI monitors non-traditional variables such as number of mobile and Internet streaming viewers and online “buzz” in social media VS TV Rating (2000 people meter attached to tv), hope this news will give Jaejoong and Manhole Team more strength and inspiration. 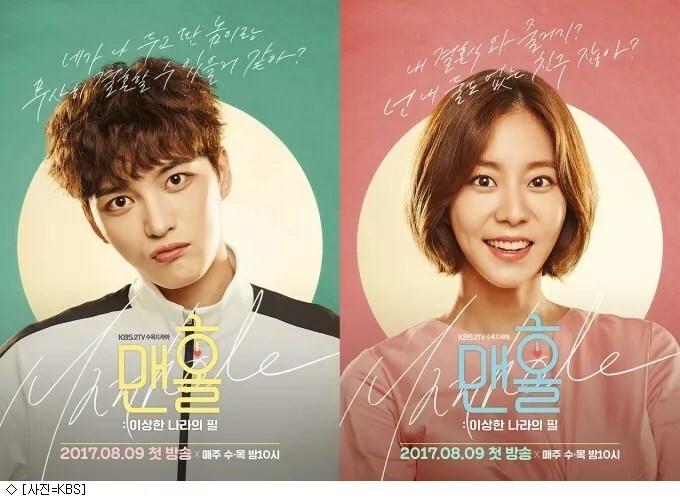 Hoping ratings will pick up later since were not yet halfway through the episodes..i’ve seen in my t-line, those who watched Manhole like the unique funny story..let’s keep cheering for them. Jaejoong fighting! Manhole! I watched a news story last year about traditional television drastically falling behind in popularity, partly due to more streaming services flooding the market, but also a lot because more & more viewers, esp the younger demographic, are watching TV from their laptops, mobile phones, etc. Not to mention with all the catch up/replay services available, they’re watching it when they choose, rather than when a program actually airs. The television channels themselves are realizing how important it is to have online access to their shows & to cater to that growing demand of viewers watching what they want when they want & on the device they choose. If the ratings are taken from such a small viewer pool – just 4050 households across SK & only from the TV, than can it really give a truly accurate reading of just who is watching what? Anyways, ratings schmatings! Jaejoong is doing such a great job, his acting improves from episode to episode & that alone makes him more bankable for future drama/film roles. & we’ve always known our Jaejoongie is unique. I love to see what drama roles he will take because he doesn’t just go for the one he thinks will be a big hit but for the one that speaks too & interests him the most & he puts so much of himself into everything he does. If Jaeojoong & his projects are too unique for mainstream television viewers, that’s their loss! But seeing him doing a project that interests him, that he puts all his heart & soul into, getting even more of an insight into who he is, that’s our bonus for loving & supporting someone as special & as wonderful as Jaejoong. This is where CPI (Content Power Index) plays and this ranking considers all shows in Korea, not just drama so to rank #2 is already a big thing. I come across with this article “TV Ratings Are Way Down, But Does It Even Matter Anymore?” http://www.vulture.com/2017/05/tv-ratings-are-way-down-but-does-it-even-matter.html , it isn’t in SK but so relatable. ” In 2017, how a show does in the ratings is often no longer the deciding factor in determining whether it lives or dies, networks have finally accepted reality: people aren’t watching TV the way they used to, and selling commercials isn’t enough to pay the bills (and make a big profit) ” thus they innovate. The ratings are tragic and i fear it will fall to 1%…this is sad! I hope this will make producers to stop casting so many idols in a drama. And Jaejoong deserves a better leading lady…UEE’s acting is bad! Will the low ratings affect this drama? Do you think they would cut it by fewer episodes? I really hope not …. Let’s all be positive and keep our fingers crossed. Very well said @Sapphire, yes in our own little way, let’s use our online time and SNS productively, let’s do it guys. And in addition, Korean fans are tweeting news links, let’s open those links and share. If I watch it online on KBS2 channel when the drama airs, does that not affect the raitings? Only TV is necessary??? If you watch online you are contributing to CPI (Contents Power Index) Co-developed by CJ E&M and ratings research firm Nielsen Korea (CPI monitors non-traditional variables such as number of mobile and Internet streaming viewers and online “buzz” in social media, that’s where Manhole gets #2 in rating, let’s continue streaming and doing those things @Sapphire mentioned. TV Viewership ratings are provided by two companies in South Korea, AGB Nielsen Media Research and TNmS. AGB collects viewership data based on 2050 households, while TNmS has 2000 households with measuring devices, so unless the tv has that measuring device called “people meter” , it’s not contributing to the rating.